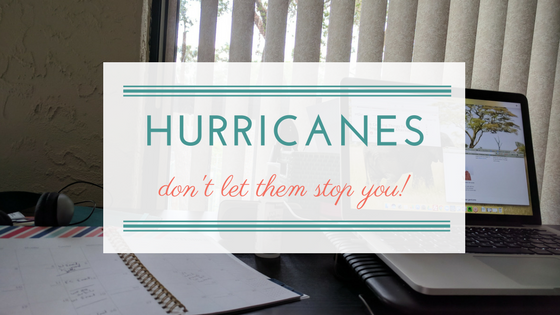 You are here: Home / Portable Careers / How Not to Let a Little Thing Like a Hurricane Stop You! On September 10, Hurricane Irma blanketed the entire state of Florida with tropical-force winds and rain. Yes, the entire state. It was a B-I-G storm. Living near Orlando, we watched its path anxiously, and prepared as best we could. We’ve gone through hurricanes before, lots of them. We still vividly remember Hurricane Charley in 2004, which turned all of metro Orlando into a sea of blue tarps. Back to the present day. . . Irma arrived in the late afternoon, bringing wind and rain. A few minutes after 7 PM, our power went out. We dragged out the flashlights, and watched, and waited. Around 10 PM we retreated to an interior area, away from all outside doors and windows. At about 5 AM, the wind had died down enough that I finally went to bed. In the morning, we found a huge amount of debris from downed trees, huge branches, and smaller vegetation, although fortunately not a lot of property damage. And we were still out of power, along with about 70% of all Floridians. Over the next few days, power was restored to a lot of homes and businesses, but not ours. All told, our power was out for over a week. Thank Goodness I Developed a Portable Career! Once I knew the hurricane would affect us, I scrambled to turn in a project before the deadline, knowing I needed to make sure it was in the client’s hands before the storm hit. A couple of days before the storm arrived, I emailed my other active clients to let them know that we were in Irma’s path and that I would likely not be able to work for a few days. I also told them I would reach out when power and internet were back to normal. They were all very understanding. After a couple of days without power at home, I started taking my laptop to neighborhood cafes and friends’ houses (those whose power had been restored) to get some work done. It was a great excuse to visit with one friend I hadn’t seen in a couple of years, even though she only lives about 10 minutes away. After a couple more days without power, I packed a suitcase and my laptop and went to stay with my sister in Virginia. While it wasn’t exactly business as usual, I was able to get back on track. 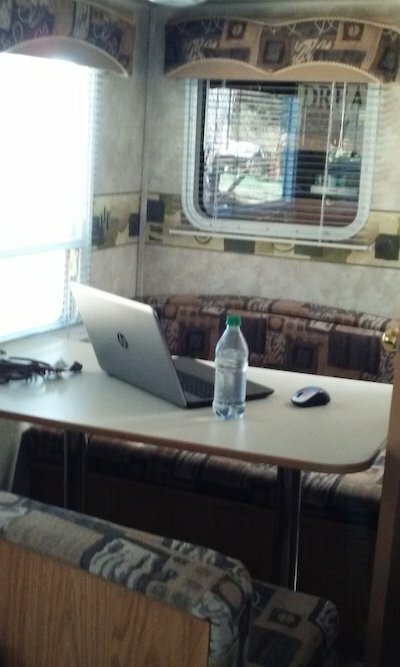 She set me up with my own little office in their travel trailer. Here’s what my temporary workspace looked like. Once you’ve established your freelance business, or whatever it is that you’re doing, you can work pretty much anywhere, even without a hurricane. Here are some tools to help you develop your own portable career.